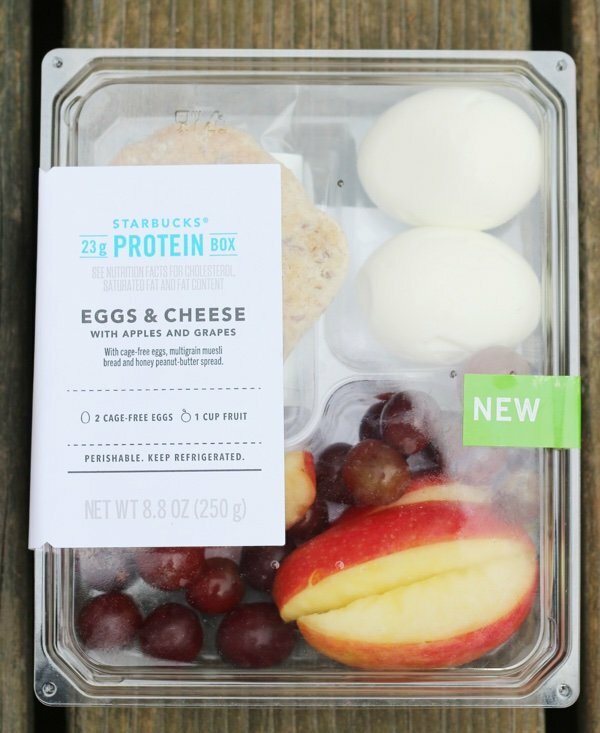 A protein box is a creation from Starbucks. I saw these babies and I was inspired! The Starbucks' protein boxes sit in the refrigerated case and they seem to be tailored for the “I am about to get on an airplane” set. I purchased this one – they have a few different types – for a whopping $6.15 at my local Starbucks. 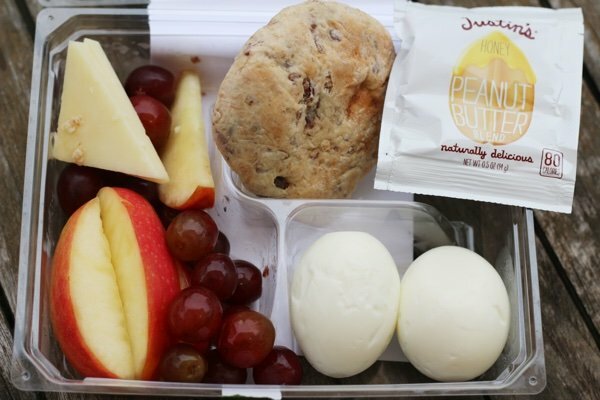 As you can see it features hard boiled eggs, cheese, fruit, and honey peanut butter (which I gave to my daughter). The sad part was that the cute little roll was soggy!! Oh man. I do think this is a great idea and I know why Starbucks has created this. Let’s say you are on your way to work and you forget your lunch. As you grab your hot cup of joe – you spend an extra six bucks on this cute protein box (which must be good for you) and your problem is solved. My problem continues to be the six bucks. I decided to make my own protein box from food I had in my fridge. Whole grain bread? Check! I have Dave’s Killer Bread in my freezer. Delicous peanut butter? Absolutely – got the healthiest peanut butter in my fridge. Cheese, fruit, eggs? No problem. The only thing I didn’t have was a cute container which Amazon.com solved. 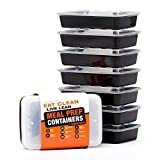 I bought these 2 compartment, meal prep containers (BPA free and dishwasher safe) to pack my protein box. I thought the quote on the side was cute. The sky is the limit with these boxes. You can pack baby carrots, hummus, ranch dressing, grapes, orange slices, turkey, grape tomatoes, celery sticks, PB&J, almonds, walnuts…..whatever! Just be sure to make it super cute so you won’t grab yourself something that looks more appetizing (such as a burrito) later. Another tip, hide it from yourself so you don’t munch on it all morning and then have nothing to eat at lunch time (happened to me!). Do you make your own protein boxes? I wish I would of seen your container before I bought mine, Ziplock brand. I saw this idea on a Weight Watchers site and have been using it. These are great! Plus one of my fav quotes by my fav founding father! I’m a quote-spouter like my mom and grandmother (and now my kids are, so funny!) As I read your post I was thinking, great idea putting together your own, fresher, ‘know what’s in it’ protein box to go! 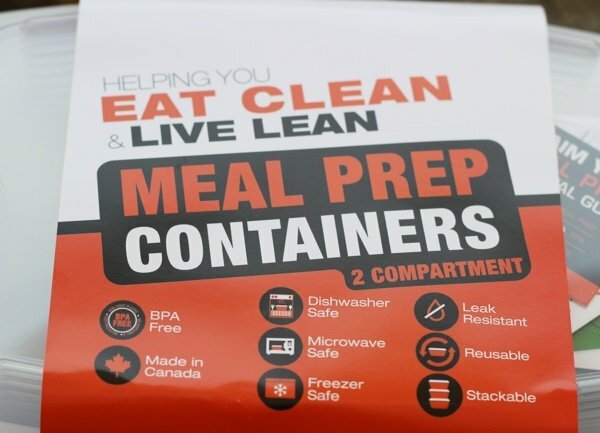 Then I saw Justin’s PB packet—neat to go PB, would like having those around for snacking! LOVE your home-made box of protein goodness! [seriously more attractive, better contents and cost.] I will pass it on to friends and family. They look more like carb boxes than protein boxes, especially that one from Starbucks. I love this idea. I never go to Starbucks, so I wouldn't have seen these. I thought of school lunches, which are a problem because our child doesn't eat anything anymore. But he might like something like this because of the variety in it. One thing, our school does not allow peanut anything or tree nuts or apples slices that have been cut at home. They do allow prepackaged apples slices, cookies, and other prepackaged snacks. For some reason they do allow grapes we wash and pack at home. Those rules limit what we could pack in our protein pack, but it will be fun to try this. Susan, I can understand the ban on allergy foods [nuts] but what can be the reason for commercially prepared apple slices vs. a home-sliced apple? It sounds like a corporate strangle-hold. Reminds me of the coke/pepsi machines in our high schools because of their funds' deal. Do you know the reason given for this? 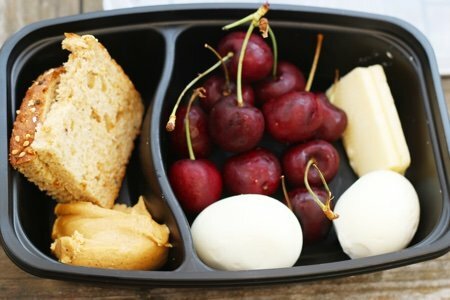 I've had lots of experience with trays like these, and there's not a better tray than easylunchboxes.com. I've gone through the cheaper ones (crappy) and trust me, these are worth the investment. I've had mine for over 6 years and still going strong. And they can go on the bottom rack of the dishwasher. They have 3 compartments instead of 2, and she has a ton of ideas on her website. I use silicone cupcake holders for dividers in the big part, if needed, and they work great. Trust me - buy them! The only drawback is that they are not liquid-tight, but you can put other small containers inside it for sauces, etc. Our church's dayschool sells them as a fundraiser (the kids have to bring their own lunch every day) and the teachers LOVE them for the kids to use (easy to open, etc) and I still pack my 9 & 12 year old's lunches in them for school every day, and have had them since they were 3 years old, and they're going strong. I pack my lunch in them all the time, also. Great for all ages! The school gives no reason for foods like pre-packaged apple slices. The sent home a list of acceptable foods, and crackers, cookies, and such are listed by brand name and have to be in commercially packed, single serving packs. It's similar to Halloween safety "rules," and I think the school does not trust parents to pack foods without traces of peanut. Aside from knowing and controlling what goes in these creations and being more cost effective, the other benefit is the environmental consideration in not purchasing a container that you use once and throw away.